Stuart Carswell and Simon Ramsden also on departure list as three are offered new contracts. Scott McDonald is one of 16 Motherwell players who will leave the Scottish Premiership club this summer. Just 48 hours after confirmed their top-flight status in a 6-1 aggregate win over Rangers in the Premiership play-off final, the North Lanakshire side have confirmed a large proportion of their squad have now left the club. Lionel Ainsworth and John Sutton have been offered extended contracts along with striker Lee Erwin, although he has been linked with a move to Leeds United over the course of the past few days. 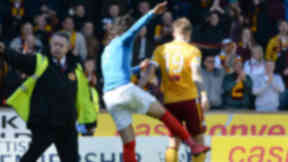 Stuart Carswell, Adam Cummins, Simon Ramsden, Paul Lawson, Iain Vigurs, Bob McHugh, Zaine Francis-Angol, Fraser Kerr and Ross Stewart have all seen their contracts expire. Short-term contracts and loan deals for George Long, Mark O’Brien, Anthony Straker, Louis Laing, Nathan Thomas, Conor Grant and McDonald have also ran out. In a statement on the club website manager Ian Baraclough said: "I would first and foremost like to take the time to sincerely thank each and every player who is leaving the club for all their hard work and endeavor. "Guys such as Bob McHugh, Stuart Carswell and Ross Stewart have been Motherwell players for a significant amount of time and deserve particular recognition for their length of service. "Simon Ramsden, Fraser Kerr and Zaine Francis-Angol have been at the football club during an almost unprecedented period of success and played their parts, as did Paul Lawson and Iain Vigurs. "We wish each and every single player leaving the club all the very best with their future careers. However, I feel we need a freshness in the squad and that’s my role over the summer. "Some of the lads who arrived during January and February certainly impressed and aided in our league survival, and we would be keen to keep them on. "However, we still need to have a conversation with either the individuals or their parent clubs to see what is possible. "We have or will also offer extensions to Lionel Ainsworth, John Sutton and Lee Erwin for next season. That process has begun and we hope they will stay, but face competition for all three. "We will offer them the very best we can though and hope they see themselves fitting into the way we want to play in 2015/16 and beyond."